I believe in the power of art to foster connection and transformation — particularly on issues related to violence, structural inequity, and community healing. My art practice furthers my advocacy to end gender violence and spur racial equity. In a way cold facts cannot, art opens up dialogue, furthers healing, and creates spaces that allow for change. From public art projects to creating films to leading healing workshops, I’ve engaged with communities in creative practice to widen our possibilities for our selves, an equitable society, and complex truths rooted in diverse experiences. How do we end viole nce and heal ourselves? How do we do so in community? How do we enable creative practice to regenerate our possibilities and create new stories for our pasts, present, and futures? Building on my work to end gender violence, in the community-based project Movement to Power, we brought together Asian American survivors of gender and sexual violence, gender justice advocates, and community members invested in ending violence to move, express, heal, and transform our relationship to violence, our communities, and ourselves. Hosted by the South Asian Women’s Creative Collective, I served as Project Director for this free six-week creative arts workshop series. 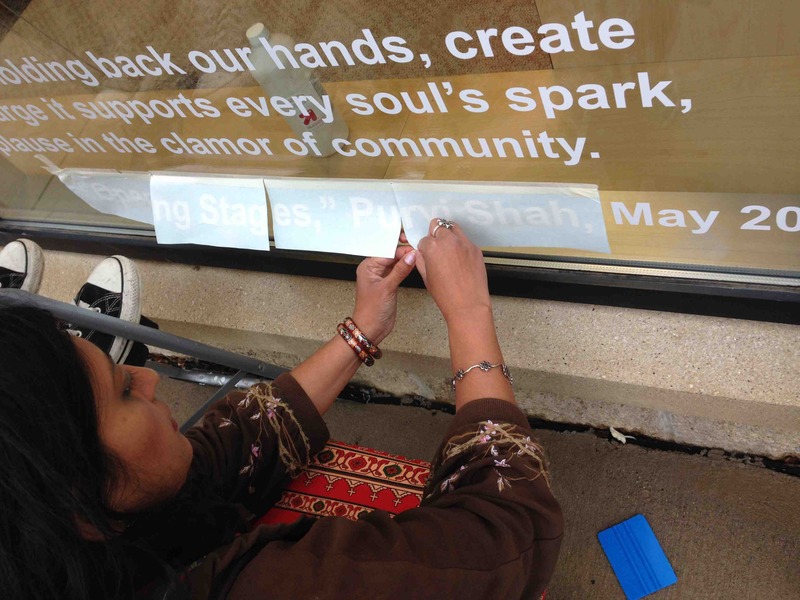 Alongside co-facilitators Deesha Narichania and Parul Shah and project participants, we generated a safe space for connection, community-building, and healing. See for yourself in Movement to Power, a short film capturing our work of transformation. Make Your Self Meek / Make Your Self Vast explores the bridges between what we experience in the world, our bodies, and states of mind. How does this web of being relate to how we see ourselves, experience our bodies, engage the world, and make a place for our Self? How are we shaped by our world and experiences? How does our well-being reflect in our body and how does our body reflect our well-being? In this participatory art project shown at the LMCC Workspace Open Studios in April 2017, Anjali Deshmukh and I encouraged people to explore, play, interact, reflect, and learn on a space created on the floor. Here we guided participants through movements and enabled them to pause to feel and witness their bodies & physical and spirit connections. Afterward, we enabled participants to take home a talisman based upon how they seek to move in the world – and how these movements would be embodied. Participants also added to a Community Wishing Well – fostering individual and community healing. In June 2017, along with artists Keva Fawkes and Anna Swanson, I spent a two-week residency partnering with a series of different Grinnell, IA community organizations to produce social map of the town’s four quadrants. From its founding, Grinnell played a role in the Underground Railroad, and its intersecting rail services have been at the heart of the town’s growth and presence, both literally and figuratively. We asked: How can Grinnell continue its spirit of justice for marginalized socioeconomic and racial groups? How do we build communities of (intersectional) belonging? What does it mean to be committed to freedom? 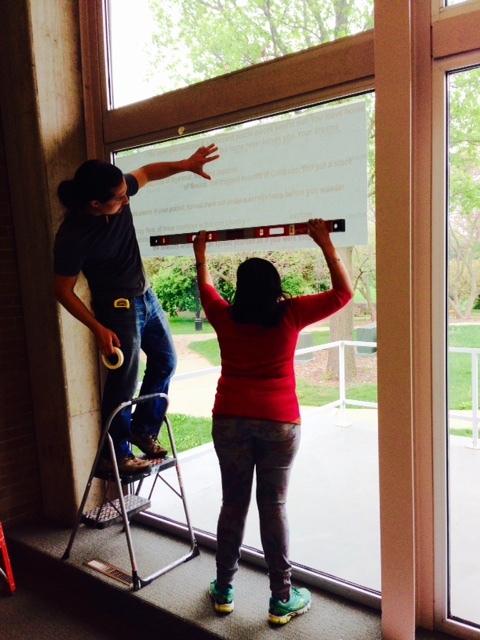 And what does freedom look like today in Grinnell? We interviewed 14 community members about their lived experiences in Grinnell and what it means to belong to the town. From the map and interviews, we generated a toolkit for transformative listening and community conversations, launching it on June 30 during a final community gathering, dialogue, and meal. 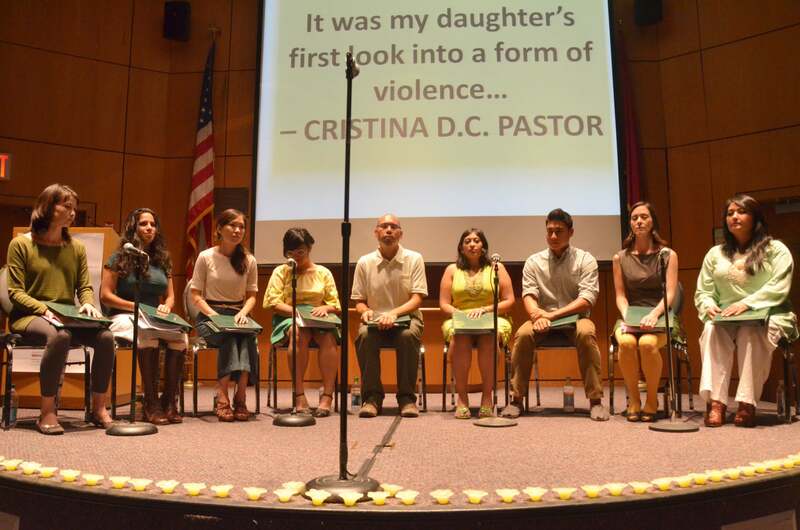 For communities facing the aftermath of 9/11, community storytelling and poetry of witness is vital. In Together We Are New York: Asian Americans Remember and Re-Vision 9/11, a polyphonic multimedia performance and community-based art project, Asian American poets interviewed community members on their experiences with 9/11 and the decade since. Our community voices — survivors of the attacks and racist backlash — have often been overlooked or silenced. Through oral storytelling, multimedia creative expression, and dialogue, we helped to ensure Asian American community voices were presented and shared as a vital part of the fabric of city memory and our nation’s journey forward. Each multimedia performance included audio clips of interviewees, original poetry, and dialogue with audiences. I served as Artistic Director of the project and film scriptwriter. In partnership with Kundiman, the poet team comprised Hossannah Asuncion, Tamiko Beyer, Marlon Esguerra, April Naoko Heck, Eugenia Leigh, Bushra Rehman, Zohra Saed, R.A. Villanueva, and myself. How do we end violence against women? One answer is through art, storytelling, and action. In What Creates Change?, hear the stories of survivors of violence along with staff and volunteers of Sakhi for South Asian Women. In this short film, for which I served as Executive Producer, we offered elements of change including allies, courage, determination, self-reflection, and faith. This film, with photography by Fariba Alam and music courtesy of Karsh Kale, has been presented at community and organizational events to further community action on ending violence. The films I developed at Sakhi opened up stories to end violence while furthering specific policy change on language access in the courts. By charting struggles and the power of transformation, we see how together we can create change. It takes a community to create community art. 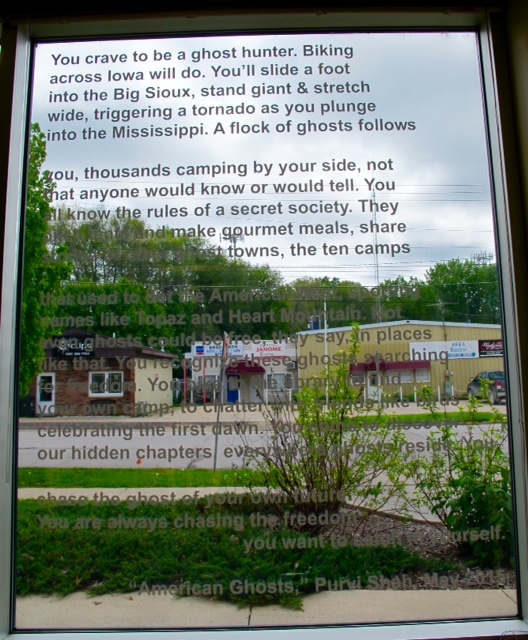 In May 2015, partnering with Grin City Collective, I created poems after connecting with community members & library staffs in 3 Iowa towns: Grinnell (Burling Library), Marshalltown, and Cedar Falls. 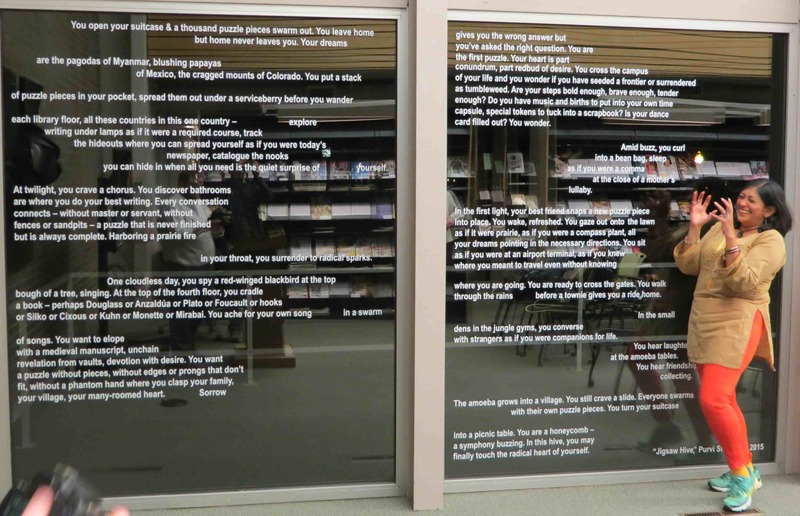 We placed my poems, spun from interviews and my observations, on vinyl on library windows. See poetry, see the world. 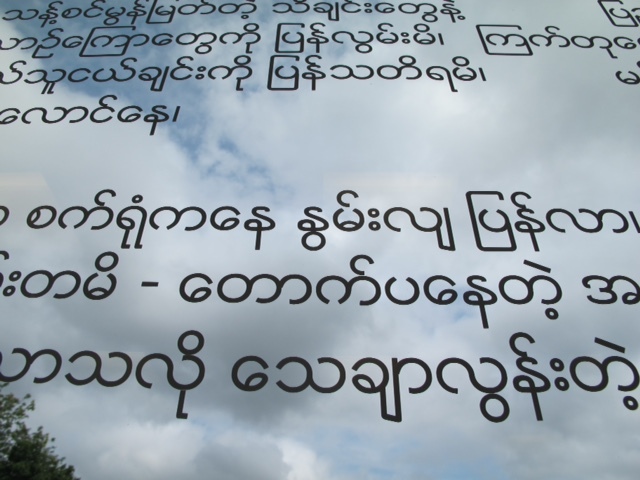 In exciting community involvement, the Marshalltown Library chose to have my poem appear in Spanish and Myanmar to reach its diverse communities. Thank you to Veronica Guevara for the initial Spanish translation I riffed on and to Joan Jaimes for double-checking me! Thank you to Pandora for her Myanmar translation. Thank you to all the amazing community members (adults, teens, and kids!) & library staffs who shared their stories with me: together we can keep creating the world we want to see.